The Director General of the International Rice Research Institute (IRRI) said that they are ready to provide required technical assistance in utilizing satellite technology to reduce the impact of climate change on the country’s rice production. 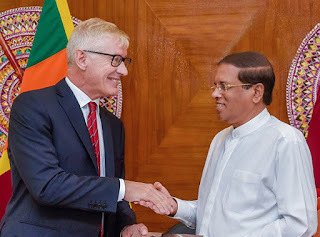 The Director General of the IRRI Dr. Matthew Morell made these remarks when he and his delegation met with President Maithripala Sirisena at the President’s Official Residence in Colombo, yesterday, 19th June. During this meeting he emphasized the importance of being self-sufficientto meet the demand forrice consumption nationallywith the climatic changes faced by the countries in the region. The Director General said that their institutionis keen to work with the Department of Agriculture to increase the quality of rice production in Sri Lanka and to provide technical assistance to reduce post-harvest losses. He also said that it is expected to introduce new techniques to promote the value addition of rice. The President extended his gratitude to the Director General of the International Rice Research Institute for visiting Sri Lanka and said that he wish to visit the IRRI in Philippines in the near future.